Greetings and salutations from the battle bridge, i.e. my cell phone. 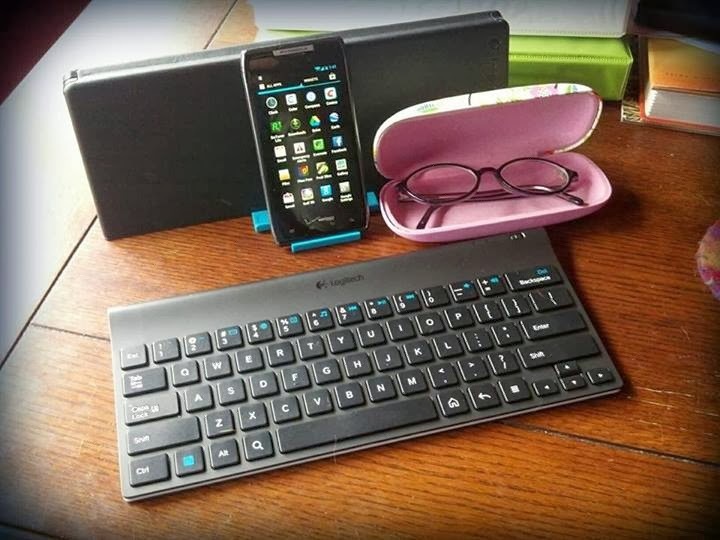 No lie--I’m typing this on a Bluetooth keyboard that Rudi got for me. This is my actual set up. See those eyeglasses? When you're typing on a 7" screen, those are MANDATORY. Since the untimely death of my big fancy desktop computer, I've been making do with my phone and I kind of like it! It is fast, lightweight, small and portable. All around futuristic. I've decided to just go with this for the foreseeable future, or until I go blind from trying to read the tiny screen. When last we met, I had promised to answer some reader questions about homemaking, but in the interest of getting back in action (see what I did there? ), I'm going to give you a couple of homemaking tips, and we'll pick up with questions in a future post. You don't have to cook from scratch. Seriously, don't feel bad about using a can or a box or a bag of something. The first rule is "feed the baby". So if feeding the baby means opening a bag of pre-cut salad and dumping it in a bowl, do it. If it means opening a can of this and a can of that and heating it all until it is hot, do it. And walk away with your head held high. If you want to feel virtuous, learn to make one thing from scratch and master it--make a roast beef worthy of a magazine cover, or an prize-winning fruit pie, or bake a perfect loaf of bread. I'm not picky about what you make, just give it your all and then wallow in pride. I've created a little newsletter so that I can give out presents. Yay! When you join the Homemaking for Beginners newsletter, you will automatically get free updates when I post to the blog each week, access to all the worksheets and additional materials for this series as they become available, and the occasional video or audio pick-me-up. I promise I will never give out your email address, but from time to time I will tell you about special deals I am offering on classes or materials. (Don't worry, you can always unsub later if you like). Ro, I'm glad you're back. I second the "You don't have to cook from scratch." It's nice to have the skills to be able to, if you run out of something and save a run to the store or to save some extra money. But a box or a can saves my sanity when our schedule is crazy.